We demonstrate the ability to exploit in-plane resolution of ~ 15 nm and axial resolution of ~ 35 nm by combining X10 Expansion Microscopy with Airyscan 3D imaging. In October 2018 I flew across the world to the laboratory of Dr David Crossman at the University of Auckland in New Zealand. The goal: to study pathological remodelling in human heart biopsies from patients with idiopathic dilated cardiomyopathy (IDCM), using the super-resolution imaging technique expansion microscopy (ExM). Our interest lies in seeing whether nanodomain remodelling observed in a rat model of heart failure in Leeds, including reorganisation of the internal calcium compartments and functional modification to calcium-handling proteins, is also present in end-stage human heart failure. Understanding the mechanisms of remodelling is one of the first steps towards investigating whether they can be targeted for preventative therapies. ExM is novel imaging technique, enabling super-resolution imaging by spatially separating fluorophores within a swellable hydrogel. The compatibility of ExM gels with standard microscopes enables greater imaging depth and improved axial resolution over competing super-resolution techniques. ExM therefore provides a practical tool to observe remodelling within dyadic calcium release clusters. I was responsible for starting ExM experiments from scratch in a new lab across the world, requiring efficient independent work to obtain meaningful data in the space of just 4 weeks. It was fantastic to take this journey and work in a laboratory that is home to a strong consortium of leading cardiovascular researchers. In my final week I gave a 30-minute seminar, in which I presented work to the physiology department and the wider bio-imaging facility. This allowed me to reach an international audience and receive valuable feedback on the progression of my research. Many thanks to the MRC and DiMeN flexible fund grant which made this trip possible, and special thanks to David Crossman for welcoming me into his lab. Follow Tom on Twitter: @TMDSheard. Abstract: Remodelling of the membranes and protein clustering patterns during the pathogenesis of cardiomyopathies has renewed the interest in spatial visualisation of these structures in cardiomyocytes. Coincidental emergence of single molecule (super-resolution) imaging and tomographic electron microscopy tools in the last decade have led to a number of new observations on the structural features of the couplons, the primary sites of excitation-contraction coupling in the heart. 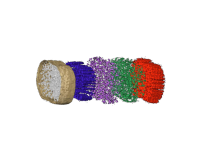 In particular, super-resolution and tomographic electron micrographs have revised and refined the classical views of the nanoscale geometries of couplons, t-tubules and the organisation of the principal calcium handling proteins in both healthy and failing hearts. These methods have also allowed the visualisation of some features which were too small to be detected with conventional microscopy tools. With new analytical capabilities such as single-protein mapping, in situ protein quantification, correlative and live cell imaging we are now observing an unprecedented interest in adapting these research tools across the cardiac biophysical research discipline. In this article, we review the depth of the new insights that have been enabled by these tools toward understanding the structure and function of the cardiac couplon. We outline the major challenges that remain in these experiments and emerging avenues of research which will be enabled by these technologies.